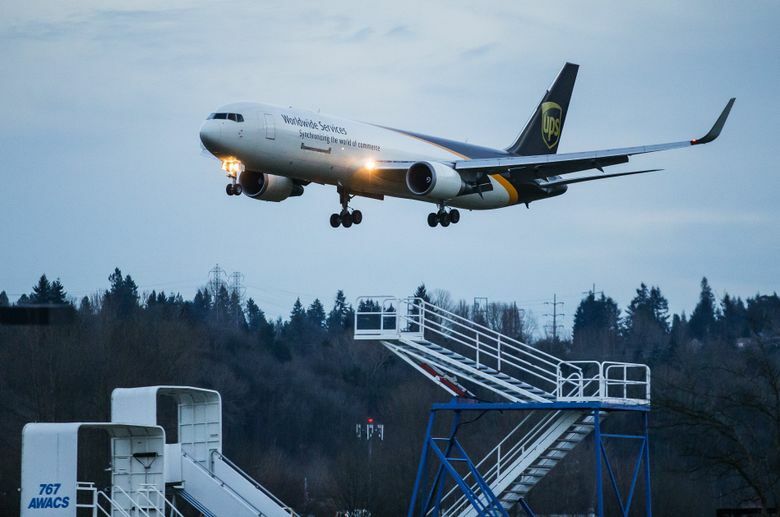 The latest deal, this one with Atlas Air, signals the seriousness and scope of Amazon’s intention to go big in logistics, as its fast-growing shipment needs exceed the capacity of traditional carriers such as UPS and FedEx. Amazon.com will lease 20 cargo planes from Atlas Air Worldwide Holdings, a deal that will double the size of the tech and retail giant’s emerging air force and could give it a sizable stake in a second air-freight company. The move comes just a few months after Amazon struck a similar deal with Air Cargo Transport Services Group (ATSG). The latest deal signals the seriousness and scope of Amazon’s intention to go big in logistics, as its fast-growing shipment needs exceed the capacity of traditional carriers such as UPS and FedEx. The strengthening of its transportation capabilities is all the more urgent as Amazon bets on quasi-immediate delivery services to edge out brick-and-mortar retailers and other online competitors. Amazon’s sales grew an eye-popping 28 percent in the first quarter, to $29.1 billion. Its shipping costs grew at an even faster clip of 42 percent to $3.3 billion. In an earnings call last week, Amazon Chief Financial Officer Brian Olsavsky said the reason for the company’s logistic forays is to “serve our customers faster and faster delivery speeds.” Amazon doesn’t intend to replace its existing logistics partners FedEx and UPS, just to complement them, he said. These are “great partners, have been and will continue to be for the future. But we see opportunities where we need to add additional capacity and we’re filling those voids,” Olsavsky said. However, a senior air-cargo business executive familiar with discussions inside Amazon’s burgeoning air-cargo unit thinks its longer game may involve building a substantial domestic network that could carry not just its packages but those of others. In particular, said the executive, who asked not to be identified because he is involved in aircraft-purchase negotiations with parties involved, said it could carry cargo for European freight carrier DHL, a global rival of FedEx and UPS and the largest customer of both ATSG and Atlas. An Amazon spokeswoman says the aircraft will be used to support one- and two-day delivery for the rapidly expanding Prime membership. The service costs $99 a year and offers shipping and other perks. In a news release, Atlas Air said it would operate the 767-300 aircraft for Amazon. The deal also gives Amazon an option to acquire up to a fifth of Atlas’ common shares over five years at $37.50 per share. Half of those warrants were awarded to Amazon at the signing of the deal, Atlas executives said in an earnings call. The rest will be awarded when the program is fully ramped up. Amazon would also get the right to buy an additional 10 percent of the shares over seven years at the same price if it increases its business with Atlas beyond the 20 aircraft. The 10-year leases will begin this year and ramp up to full service in 2018. Amazon gets a nonvoting observer seat on Atlas’ board. If it chooses to convert its warrants into 10 percent ownership of the stock, it would gain the right to appoint a director, Atlas executives said. Amazon is expected to represent a big portion of the company’s earnings going forward, they said. On the earnings call,Flynn said the air-cargo company operates 21 Boeing 767 freighters and plans to add 20 more 767-300s specifically for Amazon. He said New York-based Atlas has already acquired a number of used commercial 767 passenger jets that it will convert to freighters and that it is well along in its quest to procure the rest of the 20 jets. “We are buying them and then converting them,” Flynn said. The slow conversion process could potentially prove a bottleneck, because only two facilities in the world are licensed by Boeing to do 767 conversions. One is operated by Bedek, a unit of Israel Aerospace Industries in Tel Aviv. Boeing operates the other one, in Singapore, in partnership with aircraft-maintenance firm ST Aero. The senior air-cargo executive said a top Atlas technical executive was in Singapore this week trying to finalize a conversion contract with Boeing. And he said Boeing is far along in an approval process to open a second 767 conversion line, either at its maintenance joint venture with China Eastern Airlines in Shanghai or at Evergreen Aviation Technologies in Taipei, Taiwan. Boeing had no immediate comment. Amazon has built some flexibility into the deal. It’s leasing the 20 aircraft from Atlas initially for 10 years while contracting with Atlas to operate them — providing the pilots, maintenance and insurance — for just seven years, extendible to 10. If Atlas’ operational performance were to fall short or prove expensive, Amazon after seven years could keep the aircraft but have another company operate them — or potentially form its own airline and operate the planes itself. When completed, these 767 converted freighters cost about $300,000 to $325,000 per month to lease, according to people in the air-cargo business. Flynn said Atlas will add pilots to fly the additional 20 jets and in the past quarter accelerated its pilot-training program in Miami to prepare for the fleet expansion. In another possible wrinkle, the Atlas pilots, along with those at the other Amazon carrier, ATSG, are in intense labor negotiations. The pilots at both companies are represented by the International Brotherhood of Teamsters airline affiliate, Local 1224, and have been stalled in negotiations. ATSG pilots have been negotiating for an amended contract for more than two years. Atlas pilots have filed for federal mediation. Pilots at both carriers are conducting a strike vote this week, though an actual strike is unlikely to happen before further protracted negotiation. Local 1224 President Daniel Wells, a pilot with Atlas, said both Atlas and ATSG are losing pilots through attrition because of what they think are poor contracts. Wells said that despite the confidence expressed by Flynn, Atlas won’t find it easy to recruit more pilots. Atlas shares jumped 27 percent for the day after news of the Amazon deal, closing at $48.66. Ángel González: 206-464-2250 or agonzalez@seattletimes.com. On Twitter @gonzalezseattle. Dominic Gates: 206-464-2963 or dgates@seattletimes.com.